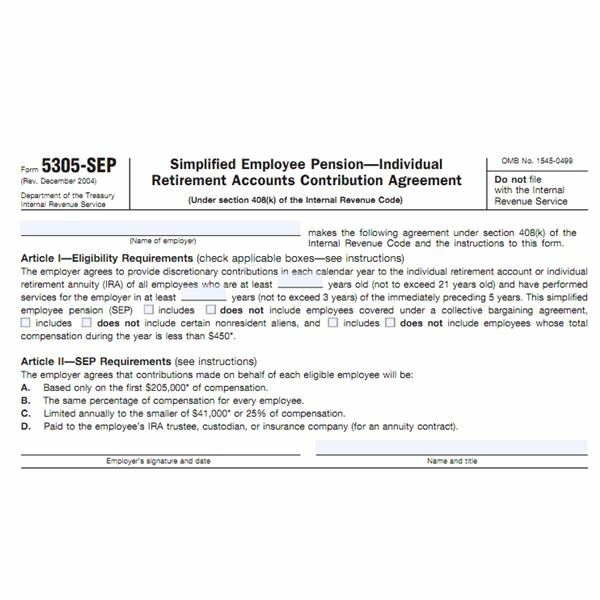 A SEP is a simplified employee pension. It gives employers a way to contribute to an employee's retirement without the complexity and overhead of a 401(k) plan or traditional pension plan. A SEP plan is setup by the business. Typically, the business uses the model IRS SEP created by Form 5305-SEP Simplified Employee Pension – Individual Retirement Accounts Contribution Agreement. In turn, each employee opens his own IRA account to be used with the SEP. This account is the SEP-IRA. A SEP-IRA is a special type of IRA account that allows for contributions to be made by someone other than the account owner. In this case, the employer contributes funds to the employee's SEP-IRA according to the SEP plan document. Unlike traditional IRAs, Roth IRAs, and SIMPLE IRAs, employees do not contribute to the SEP-IRA. Self-employed? If you set up a SEP-IRA for your business and need to know how much can I contribute to my SEP-IRA account, the rules are still the same. The contributions technically still come from the business and not you. In all other ways, a SEP-IRA is the same as a traditional IRA. All funds within the account grow tax-deferred. When money is withdrawn, it is taxed as ordinary income, and if withdrawals are made before age 59 1/2, the owner may be subject to a 10 percent tax penalty. When the account owner reaches age 70 1/2, she must begin taking required minimum distributions, or RMDs from the account. Contribution limits for a SEP-IRA may be changed each year based on annual cost-of-living adjustments. However, the index used by the IRS to determine the change in the cost-of-living did not increase enough to warrant any changes to the contribution limits for SEP-IRAs for 2011. Therefore, the limits on SEP-IRA contributions are the same for 2011 as they were for 2010. The maximum contribuiton to a SEP-IRA is 25 percent of compensation. However, in 2011, as in 2010, only the first $245,000 of compensation may be considered when calculating contribution amounts. For example, if a person earns $300,000 per year at a business that contributes 6 percent to its employee's SEP-IRA accounts, the maximum contribution to his SEP-IRA is $14,700, which is 6 percent of $245,000. The remaining earnings of $55,000 may not be used in the SEP-IRA contribution calculations. There is also a $49,000 maximum contribution limit for both 2010 and 2011 for SEP-IRAs regardless of what percentage the company contributes or how much the employee makes. There is no provision for catch-up contributions to SEP-IRAs like there are for other IRA retirement plans. Finally, if the employer has another defined contribution retirement plan, such as a 401k, an annual limitation of $49,000 (for 2010 and 2011) for contributions to all qualified retirement plans applies. In other words, if the employer offers both a SEP-IRA and a 401k plan, the total combined contributions may not exceed $49,000 for the year.